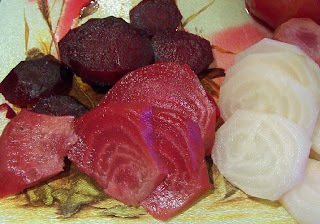 Any recipes for using beetroot? We seem to have plenty of beetroot this year - I sowed some seed to use for salad leaves and even they have grown to full size beetroots! I've browsed the Internet looking for beetroot recipes with limited success. What I really want are ideas for using beetroot as a vegetable rather than as a pickle or chutney etc. 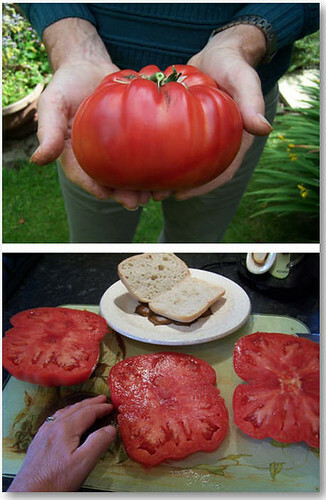 We picked - well more chopped off our largest tomato this week which weighed in at almost 1.1kg or 2½lbs. It's a Brandywine beefsteak (or maybe buffalo steak in this case) variety which is known to produce huge fruits although I haven't come across one as large as this in my trawling of the Internet. General information says it regularly produces fruit of up to a 1lb in weight. It was grown from seed in our home greenhouse in a large size growbag using a ring culture system. Must admit it was only really fed when we remembered to - nothing special just ordinary tomato food. The two large tomatoes were the first to set on the lowest truss and just grew and grew. The plant does have more fruit which have set higher up the plant but no more monsters. So let us know if you have had a bigger fruit. Harvesting has been the predominant activity this week. The second largest of our Brandywine tomatoes weighed in at 700g or 1½ lbs. It provided a thick slice of fruit - with some to spare - for each of three sandwiches. There is an even larger sister awaiting harvest. Both of our monster tomatoes were growing in our garden greenhouse which has been blight free, however, in the plot greenhouse the removal of all leaves from the blight affected tomatoes appears to be working. The fruits are ripening well. Many have been gathered, roasted and made into a passata which has been frozen. Anyone else grown a monster tomato? The effect of blight has been variable; the Belle de Fontenay potatoes were a black, oozy mess and consigned to the skip, whereas Anya, Charlotte and Juliette tubers seem to have survived. The Sarpo Mira haulms though showing symptoms of blight are still growing. The outdoor tomatoes are more or less a write-off. In the plot greenhouse the battle continues to be waged in an attempt to prevent the tomatoes from being affected. The plants now stand naked of leaves and there is little else that I can do for them. I could gather all the tomatoes and make green tomato chutney but that somewhat defeats the objects of growing tomatoes in the first place. If all fails we still have a disease free crop in our garden greenhouse. Just for information the photo album utility Bubbleshare that powers most of the albums on this blog and my website is closing on 15 November. This means I have the unenviable task of redoing all my albums. As you can imagine Bubbleshare is very busy with people trying to retrieve photos etc and so many albums on the blog and website may not load correctly if at all. Please be patient - I will transfer as soon as possible. I'm moving to Picasa so hopefully that won't go the same way!!!! Blight has continued to do its worst this week. Some outdoor tomato plants have been wiped out and there are signs of it having infiltrated the plot greenhouse. In an attempt to prevent the potato tubers from being affected we have cut back all the haulms. Although Sarpo Mira potatoes have some signs of blight they are still growing well as are a bed of Golden Wonder potatoes on our neighbours plot. If you have noticed any particular potato variety that seems more resistant to blight than others please share your observations by posting a comment. Doctor Who monsters visit the plot! 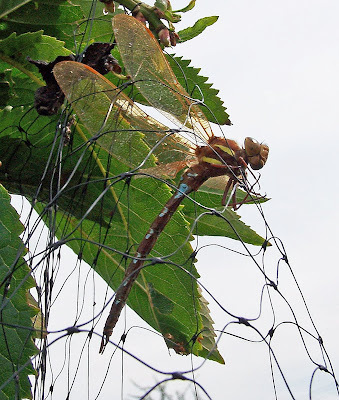 Firstly I came across - heard it first - this dragonfly that had become caught in the netting covering a fruit bush. The nearest I can get to identifying it is that I think it is a hawker. Anyone know any better? The photo isn't brilliant as it was taken upwards towards the sky and so is silhouetted. Then after being in the garden rather than on the plot I felt a tickle on my neck and found this. 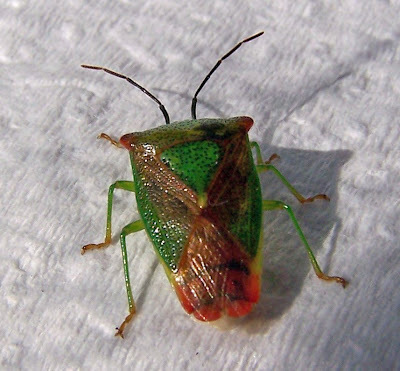 I think this is a hawthorn shield bug. 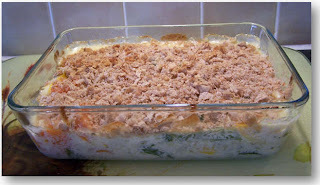 To use up some of our many courgettes I adapted a recipe found on the internet. Choosing Gardening Tools for Children? There is now a huge selection of children’s gardening tools from which to choose. They range from plastic toy tools to metal and wooden tools which are simply smaller versions of high quality adult garden tools. Generally the plastic tools are only suitable for toddlers. They do have the advantages of being light and less likely to have sharp edges but they are not as sturdy as the metal and wood versions. A wide range of types of garden tools for children are available. You can buy spades, forks, trowels, hoes, leaf rakes, brushes and watering cans. There are even some fabulous children’s wheelbarrows. School Packs are also available from some suppliers. It would have been a miracle if we had got away with it this year. Damp and windy weather provide ideal conditions for the spread of fungal spores so it was no surprise that blight paid us an unwelcome visit this week. Potato haulms are being cut down and removed in an attempt to prevent the potato tubers from being affected. The potatoes are a reasonable size for harvesting and so hopefully the crops will be OK. The Sarpo Mira variety has so far lived up to the claim of being extremely blight resistant but it’s early days. A Sarpo Mira root was dug up to check tuber size which was good, however we decided to leave the haulms for a little while longer to see whether they continued to withstand blight attack! Special Offers on raised beds and plant protection products have been extended til the end of August. Click on the links for more information.